Description: Provides an overview of advances in antimicrobial mold and mildew-proof primers, paints, wallcovering installation systems, waterproofing coatings and remediation cleaners. Permeability of wallcovering and coatings to install them with, plus green building specification information for high performance, low VOC coatings for the prevention of mold and mildew are also reviewed. David Brown has been an active member of the painting community for over 25 years. David learned the paint trade by working with his father, a union painter, for the School Board. David joined Seal-Krete, an architectural coatings manufacturer, in 1992, and worked his way up to become the product technical expert and head product trainer. Currently David is the Business Development Manager for Rust-Oleum Brands / Seal-Krete HP, a manufacturer of high performance floor coatings including epoxies, polyaspartics, urethanes, and urethane concretes. In this role David leads training on Seal-Krete High Performance products in US and Canada conducting training classes on application and techniques. David currently holds a Bachelor of Science in Marketing degree from Southeastern University, NACE Certified Coatings Inspector Level 1, ICRI - Certified Concrete Slab Moisture Test Technician, MPI, PDCA, and Microsoft Certified Systems Engineer (MCSE). Johnnie Elliott started in the paint and coatings industry in 1979 when his father bought a local paint store in Jacksonville, FL. While in college at Florida State University he began working at another local paint store in Tallahassee, FL, before beginning a 25 year career working for coating manufacturers. 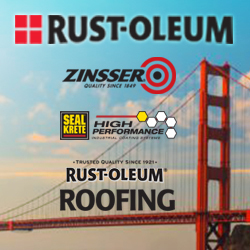 In August 2014 he became an Architectural & Engineering Business Development Manager for Rust-Oleum offering specification assistance, product knowledge, and continuing education programs. He holds the NACE Certified Coatings Inspector Level 3, SSPC Concrete Coatings Inspector (CCI), and WRCLA Specialist Certifications. AIA approved course. This course qualifies for 1.5 LU/HSW Hours. Attendees/participants may submit 1.5 hours of continuing educator credit for consideration of the following NAHB professional designations: CAPS, CGA, CGB, CGP, CGR, GMB, GMR and Master CGP. 0.15 CEU toward certification renewals. 1.5 Hour toward certification application. You need to be logged in to download the course materials for Use of Coatings to Prevent Mold and Mildew Damage.